On a mobile device, please click on the icon in upper left corner to go to the menu. Classy Creations artists, Gwen and Mike Hertz, design and hand-craft jewelry and other unique pieces. Gwen and Mike make a variety of jewelry using fused, faceted and beveled glass techniques, in addition to wire sculpture, wire weaving, chainmaille, and faceting stones. They also make fused glass home decor items such as lamps, plates, mirrors, spoon rests and clocks. "We create jewelry that is designed to make a woman feel good about herself. Our jewelry will definitely get you compliments. We use many techniques and high quality materials to create our contemporary pieces, so that they are truly one-of-a-kind. Our jewelry is constantly evolving to keep it fresh and exciting. Our art glass pieces are functional and decorative and made in a wide variety of colors." Our website showcases many of our creations, plus we provide some information about the glass and techniques we use, and how we make these awesome pieces of art. The pictures above are a sampling of some of our creations. This website is designed to be a showcase of our artworks, however, if you are interested in purchasing anything use the "Contact Us" page to send me a Comment. I will check on the availability of the item and let you know the price, if it's available. During March 2018, Gwen and Mike were Featured Artists at Artisans on fifth in Mt. Dora, FL. 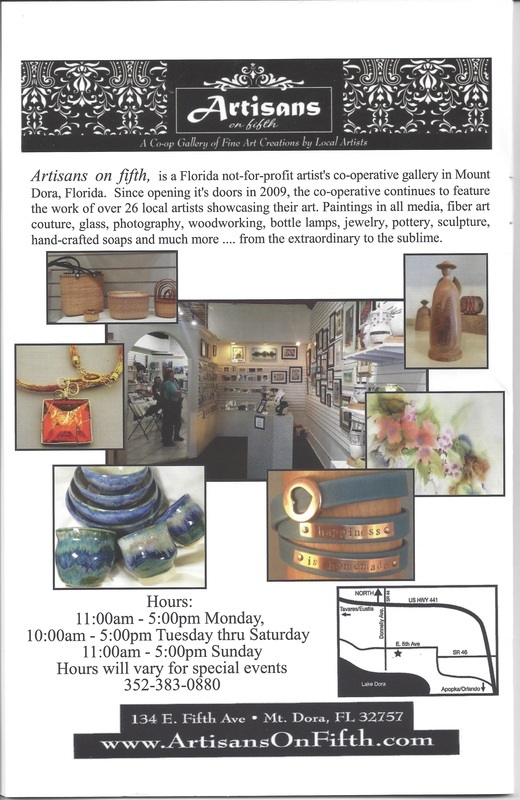 They filled the front window at Artisans with jewelry, art glass lamps and other fused glass home decor items. During March 2018 all the art glass lamps are on SALE, so be sure to stop by at 134 E 5th Ave. in Mt. Dora, FL. Although wall art is not our main focus, in April 2014, Gwen Hertz won 1st Place in Professional Cold-working at the Glass Craft and Bead Expo in Las Vegas. This is an international competition. She entered a hand engraved wall art piece that has Zentangle patterns engraved on colored dichroic glass. 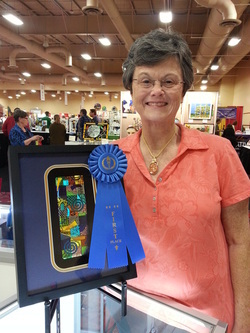 In May, 2014 Gwen won "Best in Show" with the same piece of artwork! 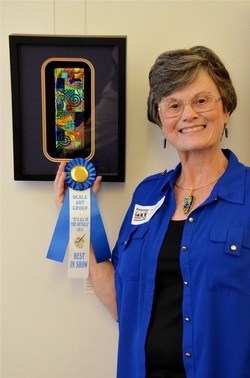 The award was given in an exhibition titled "It's All in the Details" sponsored by the Ocala Art Group (OAG). The picture, presented in a shadowbox, was titled "Zen Patchwork." Our jewelry was featured in the 2015 Annual Report of the Mount Dora Community Trust. We were featured in the "Great Living" magazine for Stonecrest residents in November 2015. 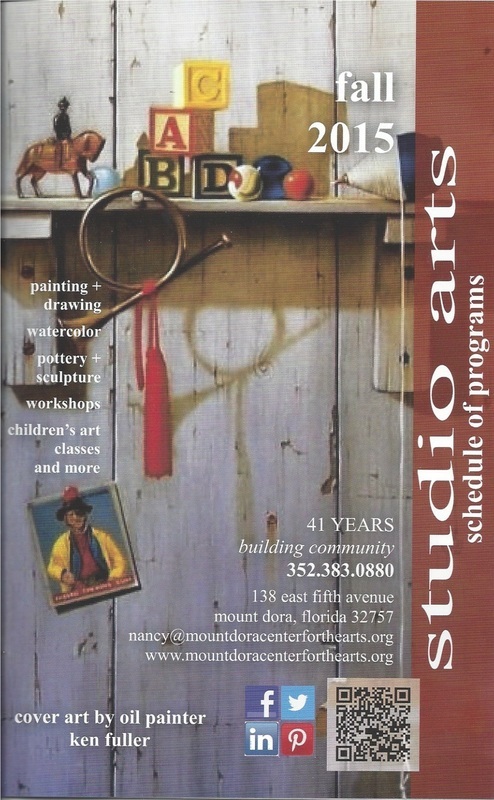 Our jewelry was featured in the Fall 2015 issue of "Studio Arts", a publication of the Mount Dora Center for the Arts. Our jewelry is the orange square beveled glass pendant with matching Viking Knit necklace. Ours is the orange pendant with Viking Knit necklace.